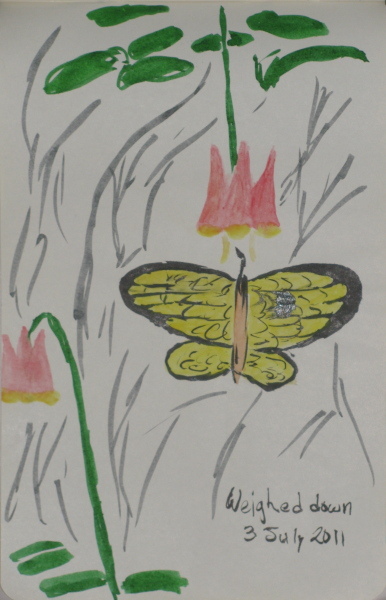 A butterfly on a columbine by the waterfall. 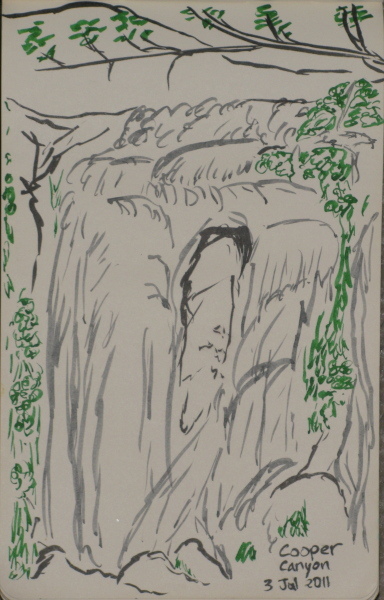 The waterfall in the canyon. 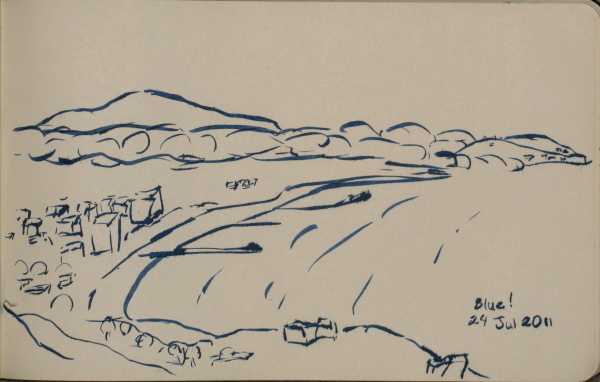 A bit of Santa Monica from the hilltop. This is another hike done with a group of geeks from the LA chapter of Hike the Geek. Heading out from any of the parking lots along Los Liones in Topanga, the trail runs parallel to the road, then starts to climb up a tight cabin at a very shallow grade with many switchbacks. The canyon somehow manages to change a bit with each of these switch backs. Many smaller trails meander this way and that, but they seem to often go nowhere rather than being shortcuts. Eventually it hits a fire road which is somewhat steeper until it flattens out. It follows a ridge and more side trails give access to the various small peaks along the way for more views. Eventually it gets to a large overlook with ocean views. There is a use trail that proceeds back down a second ridge line, hitting every peak along the way, in a more direct route back to the parking lots. These were hiked in a loop. 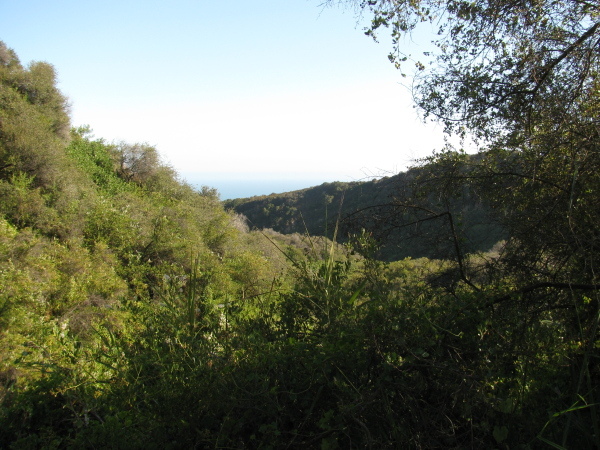 Climbing up the canyon along trail and getting a first glimpse of the ocean beyond. The canyon is lush and green, spots of the green are even high water needed sorts of green. There's some shade from trees. I tried to interest Abbie in an overnight to Bear Canyon past Switzer falls, noting that the moon would be close to full to help entice her into it. She decided that an evening hike for the moon might be fun, but it seemed odd to go down into the canyon to see the moon. The hike I was planning to go on if she didn't come hiking that weekend was much more suited to moon viewing. At 8250 feet, Mt. Islip really is a nice moon viewing spot. I thought the shorter hike from Crystal Lake would be nicest, but we decided upon the shortest route up heading from the 2. With sunset just after 8PM, we would have to leave by 6PM to get up the mountain for all the light displays. By 6:30, it was clear it hadn't been communicated well enough that we really had to leave by 6. We arrived with the sky turning colors. 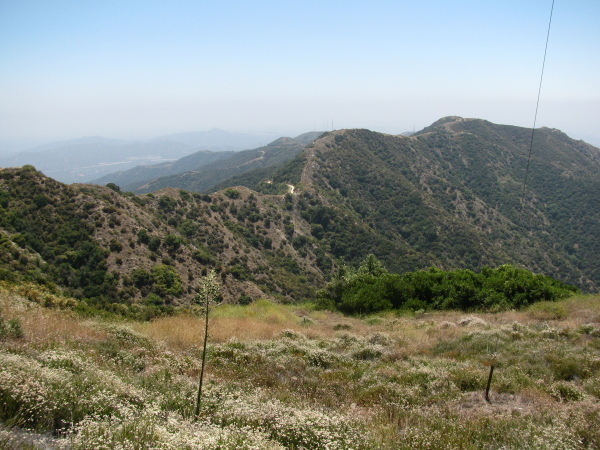 The trail up from the highway directly to Windy Gap was identified as a "use trail", and it was clear that it was. With its internet advertising, it is now a well used use trail, but it is still a narrow and steep route up a ravine with frightening moments when it isn't in the bottom of that ravine. It is also only about a quarter of a mile, so is quickly over. We arrived safely at Windy Gap where it was plenty windy. Arriving at Windy Gap, we had a colorful view to the south. All kinds of trails head off from Windy Gap. 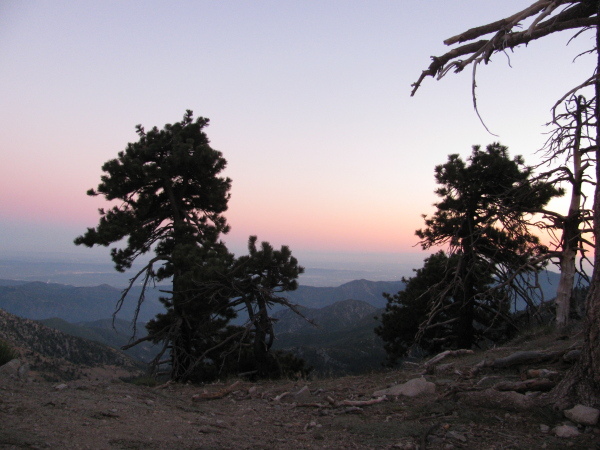 It's just 2.5 miles down to Crystal Lake and the cafe, or the PCT can be followed east to some more peaks, some over 9000 ft, and eventually to Vincent Gap, or going west to Jimmy Little Campground past a spring, or climb the mountain. Or the use trail can be followed north to quickly join with the highway. This part of it isn't too steep, but it quickly changes. We turned up the trail that would take us directly to the peak instead of the one that would stop by the campground first. The grade was much easier and I stopped questioning if I'd put too much in my pack. I actually felt lighter once I was on the maintained trail with the regulation grade. We made quick time up this easier trail. As advertised, the signs are in the wrong order so that when we met up with the trail coming from the campground we mysteriously had longer to go. The night closed in as we climbed. When we were on the south side of the mountain or in gaps, the wind blew, chilling us more than the night. We pulled on some long sleeves and I totally failed to pick the camera back up afterwards. A couple trees were across the trail, the first had a trail down to get around it and we decided it was time for lights because setting your foot wrong while headed downhill on a steep slope like that can be bad. The second had plenty of room to pass under although most seemed to go around. The next turn was made scary by the night as the trail suddenly had a black gap ahead. The turn after, we could see the shelter. Walking around the shelter, we came to the peak. All sorts of lights from the city could be seen from the south. There were more city lights to the north. They seemed to twinkle more than from lower vantage points. I looked to see what a flag had on it and found the peak logs. Settling down to look at them, I took off my pack and finally realized my camera wasn't with me. I grabbed a tube that protected the log and found that there was a second log in the form of a hard covered book in a ziplock bag under it. I flipped a little through the two logs and then Abbie wrote a little bit in it about coming up to see the moon and I put down a few lines of color to represent the moon rising over a tree spotted mountain. We tucked ourselves inside the shelter for some dinner and waiting for the moon. It is a shelter purely in a historical sense. The roof is long gone, one panel of metal is outside the west door. Doors east and west are also long gone. Windows north and south just let the wind come through. Much of the floor has found debris to hide it well. It still provided some protection from the wind. We nibbled and watched the sky. Even with all the city lights visible north and south, there were far more stars in the sky than in the lower elevations. A few shooting stars passed. Then I noticed a bright light had been turned on off to the east. After a moment I managed to adjust that reaction to the correct one and we watched the moon rise over a few bushes into our star studded sky. It chased a few of them away and it was a little past full, but it was still a very good moon. We finished and headed back down again. We came to the spot that must have been where the camera was and looked around carefully before continuing on and finding it just 10 feet further along the trail. Coming to the gap, we took deep breaths and started down the use trail with good spacing. Neither slipped, so the precaution was unneeded. We made it back to the car safely and proceeded back down the long and winding road home. The Verdugo Mountains are the dark spot I see far out to the right with the 210 snaking along at the bottom of them when I look out from one of the many perches in Pasadena at night. No part of them is very far from an accessible road and they are criss-crossed with fire roads. The folks at hikethegeek planned to hike about them and I decided to join up. I found the parking immediately south of the 210 on La Tuna Canyon. A gate blocks vehicle entry, but the pavement continues beyond it. The road nearly parallels the 210 for a quarter mile before turning to climb up into the mountains. Eventually, the pavement gives way to well maintained dirt. It came to a large fire break and a number of bee boxes. The group decided, quite sensibly, to continue along the very winding road instead of the direct and sometimes quite steep route of the break, but we watched others follow the break on up. The freeway was finally lost in the windings, giving the walk a more wild sense. At times it seemed far more windy than could ever be necessary to climb up a little mountain. It connected up with the fire break again, and a few people decided they'd done enough. 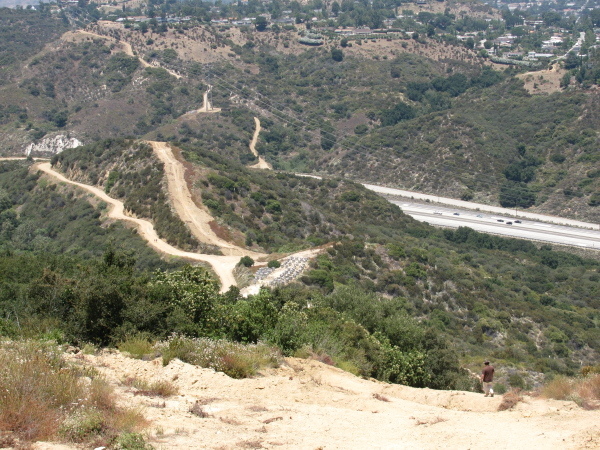 It met up with Verdugo Motorway along the top, so we had a choice to make. To the right was a delightful, much more narrow and less used road and to the left was clearly the high point of the local area so we went on the road more traveled. Yet more windings along, still many more than could be needed but it is very strict about keeping a constant upward movement, we made it up to the top. Well, nearly there. The top was quite occupied by fenced off communications towers, so we could only take a turn around near the top. Achieving the goal, as much as there was one, we soaked in the view (although visibility was not as good as one might hope) and turned back for the start. 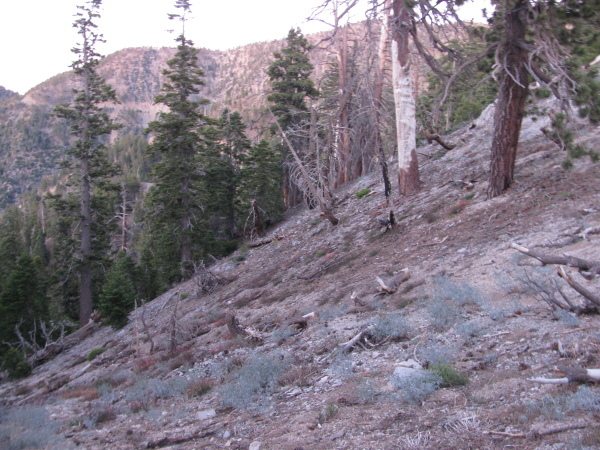 Coming again to the firebreak, this time I chose to go down it. It turned out to have a lot of soft stuff and often achieve a 45 degree angle. This was fine going down since a simi-controlled slip could be very effective for traversal, but it would have just made the way up miserable. I wondered again at the people who had decided to do so. I also got sand in my socks. Reaching Verdugo Motorway, there are helpful signs to tell us which road we are starting down whichever way we turn at the intersection. It's actually much smaller going the other way. 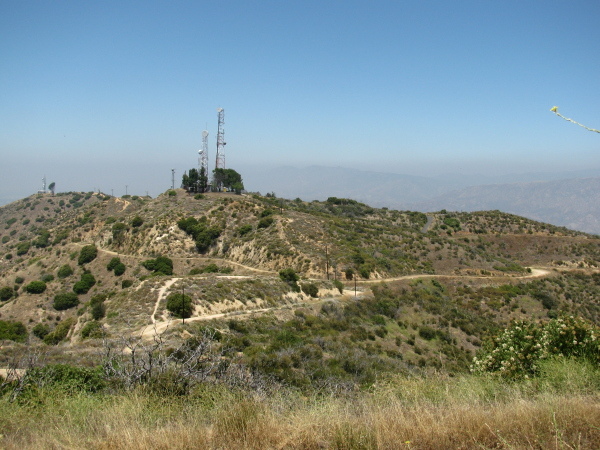 Verdugo Motorway snaking away along the ridge line and past some of the many communication towers. Looking out along the backbone of the Verdugos. 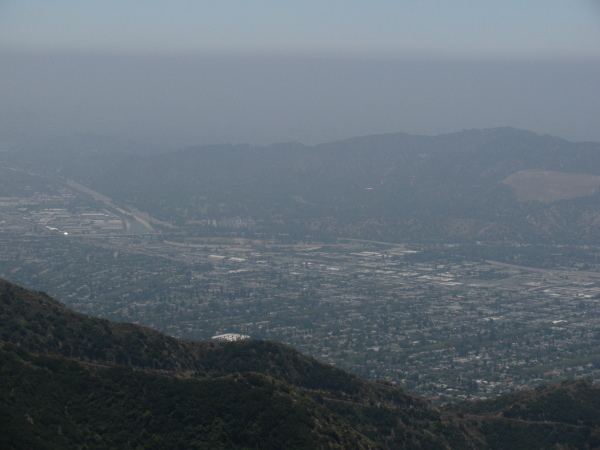 Glendale and Burbank and some Los Angeles, but it is greatly obscured by the thick air of the day. It's been rather humid, so it's not all smog out there. Heading down the firebreak. The bee boxes, the freeway, and the utility roads heading up on the other side come into view and will be lost again as elevation is lost with a vengeance. Locate the trailhead and the end point. 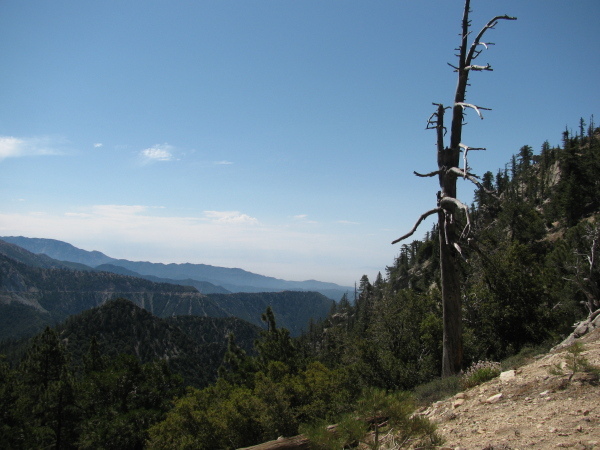 I found the Cooper Canyon Falls hike and have been wanting to go on it for quite some time. It is well outside of the burn closure, so I went for it one time, only to find the 2 was still closed at La Canada so I would have to drive all the way around, which wouldn't be so bad except the 39 is also washed out shortly before the 2. 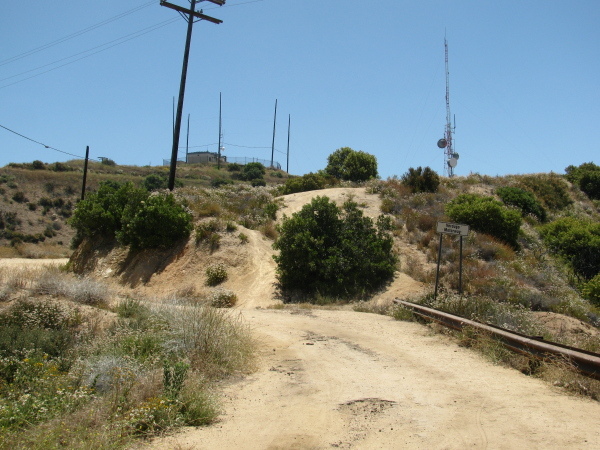 Now the 2 is open again, so when wondering where to go, I thought of Cooper Canyon again. It was even more attractive when I noticed how high up it is since it has been quite hot the last week. I double checked that it is not in burn area and noticed another closure near my destination. 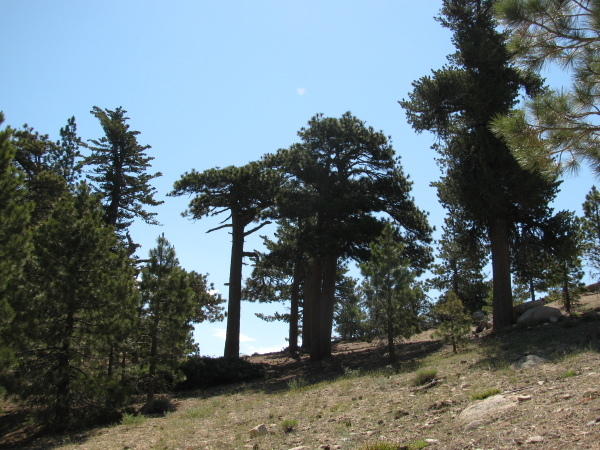 The hike calls for a loop with a shuttle going from in at Buckhorn Campground to the Pacific Crest trail and coming out at Eagle's Roost, but this second bit of trail is actually closed soon after the junction with the PCT. 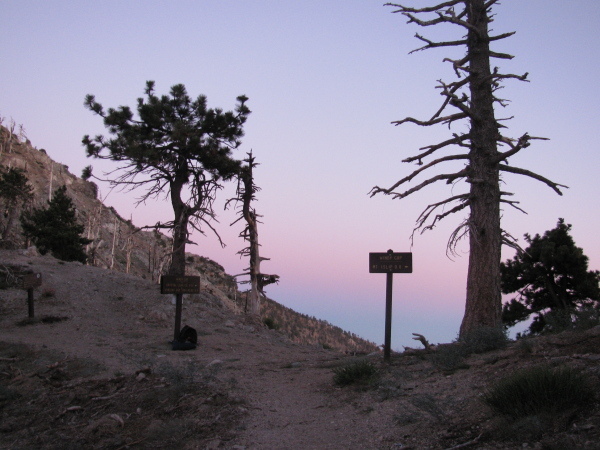 Another loop is possible by continuing the other direction on the PCT to get back to the main road. I printed out a bit of USGS to show the area and the possible hikes and took off for the trailhead. Which was closed. The road into Buckhorn was marked "hardhats only" and a paper sign showed the closures in the area, including the trail from PCT to Eagle's Roost and the roads into the campground. The campground is being redone and getting bear boxes. I was crushed. I'd made sure I was aware of the closures and there was still another closure to contend with. Just the other side of the south end of the campground road, where I was parked because it was shorter to the trail, is another trail. This goes past Buckhorn Spring and then soon comes to an end, according to my bit of USGS. I decided to see what was up there. This trail starts as a washed out fire road. It gets near a saddle loses the water damage to become a nice, easy trail climbing gently. The use pattern would suggest that people go up to the saddle and climb the tallest of the peaks near it rather than follow the road as I did. Unfortunately, the spring was either dry or misplaced, for I did not find it. Just past where it should have been, the road split, showing there was more here than my map showed. I turned back and took a peek over the saddle. Saddle that is up the fire road on the other side of the road from the exit for Buckhorn Campground, on the way to Buckhorn spring. Once up onto the saddle, there's a lot of view. This is off to the east.